Welcome to Scrutiny (Outsourcing) Ltd.
Each and every organisation that provides catering, vending and hospitality services, will at some point be faced with basic strategic decisions. Do we look at alternative supplies within the format of a competitive tender? Do we look to renegotiate the existing supply contract without going to tender? Do we look to manage the provision on an in-house basis? In all three scenarios, Scrutiny is able to provide a unique business platform to deliver the best possible result for your business. Scrutiny Tackles The Danger Of Salt In Children's Diet. Scrutiny is set to tackle head-on, the issues and concerns surrounding unnecessarily high salt content in children's diet. 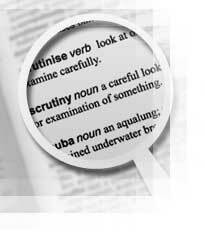 Copyright 2005 Scrutiny Outsourcing Ltd. All rights reserved.